The What: Danley Sound Labs is courting the sporting arena market and attempting to one-up line arrays with its unique Genesis and Jericho Horns. The How: Danley starts back at the fundamental physics of loudspeaker design to overcome trade-offs that are inherent to conventional designs. 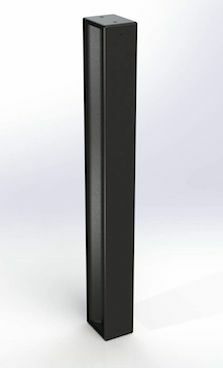 The new Danley SBH-10 “Skinny Big Horn,” uses Danley’s patented Paraline technologies to deliver the aesthetic benefits of a column speaker but with greater fidelity, superior pattern control, no spurious lobes, and no requirement for complicated signal processing, the company says. The What Else: At a weight of one-hundred pounds and with dimensions of 60-inch x 9-inch x 9-inch, the SBH-10 is composed of eight 5-inch coaxial drivers and acts as a single large Synergy Horn with the directivity of a horn over twenty-five feet. Its coverage pattern measures 140 x 10 degrees, and its frequency response extends from 77Hz to 15kHz, +/-3dB. The Why: “Danley’s new Skinny Big Horn series meets the aesthetic desire for a low profile column shape,” said Mike Hedden, president of Danley Sound Labs. “But shape is where the similarities between conventional column speakers and the Danley Skinny Big Horn end. Using our patented Paraline technology, the SBH-10 has the directivity of a twenty-five foot long horn, yet it is only nine inches deep.